Cesar Takes a Break was inspired by a real-life iguana that was a class pet in my son David’s fourth-grade classroom. Over spring break that year, the teacher came in every day to feed Cesar and take care of him. But when the class returned to school on Monday after vacation, Cesar was missing. Everyone searched frantically for him, but no one could find him. On Friday, five days after anyone had last seen him, Cesar turned up. 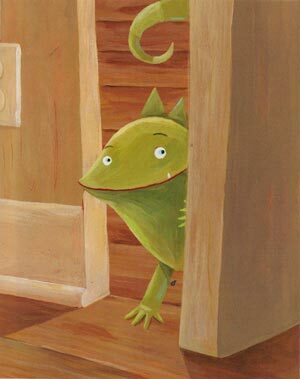 He poked his head out from a vent in the wall, and David spotted him. 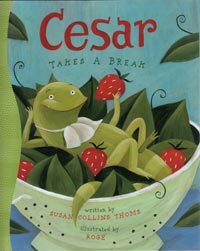 Cesar Takes a Break is my best guess about what Cesar — and all the class pets do — when the kids and teachers are gone. The first question most people ask is “Did you do the illustrations, too?” I wish I could say yes. But I don’t think I could even dream up such beautiful and fun pictures. The illustrations were created by a very talented French Canadian artist named Rogé. Click here to learn more about Rogé.